Two and a half years have passed since the disastrous oil spill in the Gulf of Mexico, but there are still open questions about the extent of the damage the gusher caused. BP and the federal government are discussing a settlement, though the exact amount of money BP will have to pay up is still unclear. 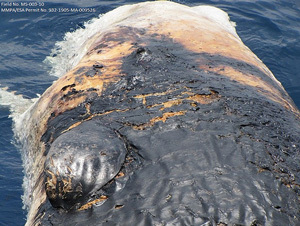 The dead whale was documented in a press release on June 16, 2010, but the Greenpeace FOIA also turned up a number of photos of the bloated, burnt whale that appeared to have been floating in the water for at least a few days before it was found. 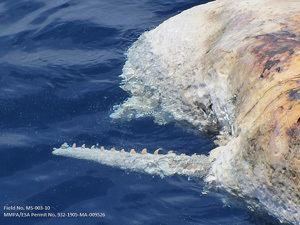 The photos are pretty grim; it’s hard to even tell it’s a whale until you notice the protruding jaw bone. It doesn’t appear that photos of it were widely circulated at the time, though at least one National Oceanic and Atmospheric Administration (NOAA) photo did appear online, and a school teacher aboard the research ship also posted some of her own photos of the body. Several of the emails released in the FOIA response state that people aboard the ship were told not to post photos. “I just spoke to the command center in Houma and they have asked that you all not post the photos to anyone as they are part of an official investigation,” says one email sent from a NOAA staffer to others on the ship, asking that they refrain from posting until they get permission from the Joint Information Center. What’s unclear is whether they ever determined what killed the whale, which was described as “sub-adult.” It was already pretty decomposed when they found it. The press release noted that it was “impossible to confirm whether exposure to oil was the cause of death,” but said that they collected skin swabs, blubber, and skin samples for analysis. Hal Whitehead, a biologist and sperm whale expert at Dalhousie University in Nova Scotia, told Mother Jones that most whales live a long time—as long as 80 years—and typically die of natural causes. The population of the endangered sperm whales was dense in the Gulf at last tally, but still relatively small—between 1,400 and 1,660. “They appeared to be doing well before the spill,” said Whitehead. But the sperm whale population was still vulnerable, and there was a lot of fear at the time that even a few deaths could severely impact the their long-term survival. Biologists also note that only some of the dead bodies are actually found and tallied; there are likely more that are never found. While this is a photo of just one dead whale, it does speak to the larger questions of just how much the Gulf spill cost—in dollars, but also in things that are hard to measure, like the loss of endangered species.